This aquatic to semi-aquatic perennial subspecies is widespread across North America (USDA 2011) and is found across British Columbia. 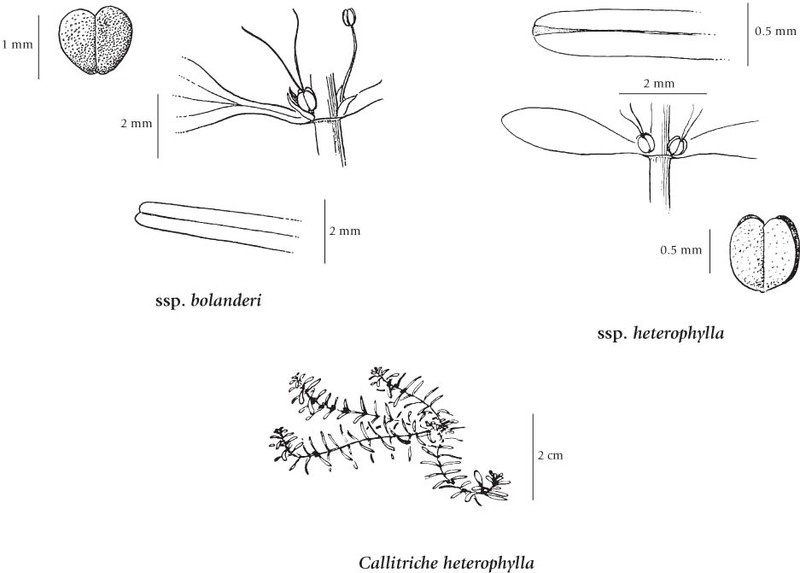 In his article on rare plants of the Fraser Valley, Lomer (2011) says: "This species as a whole is common, but the variety heterophylla is not often collected in BC. [In the Fraser Valley], records exist from the Vancouver area, including Coquitlam (UBC: Lomer 90-7), Surrey (UBC: Lomer 91-125A) and Pitt Lake (V: Brayshaw 78-794B) so it should be expected in more wetland sites in the Fraser Valley. The small fruit, less than 1 mm, mark the variety. So it is not surprising there are few records". Extracted from Botanical Electronic News #432, January 2011, with permission. Aquatic or semi-aquatic perennial rooting in mud; stems leafy, 2-40 cm long, with or without small membranous ridges between the leaf-bases. 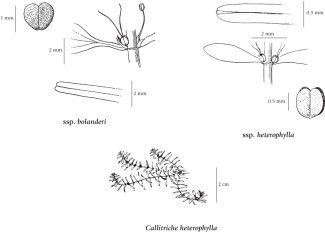 All opposite; submerged leaves linear, single-veined, notched at the tip, 5-25 mm long; floating and emergent leaves broadly egg-shaped or oblanceolate, 3-veined, up to 1 cm wide. Inflorescence of tiny, inconspicuous flowers borne with a pair of tiny bracts, stalkless or shortly-stalked; styles 1-5 mm long, ascending. Achene-like, 4, each 1-seeded, wingless or scarcely wing-margined, rounded, egg-shaped or heart-shaped, irregularly pitted. Two subspecies occur in our region. 1. Fruits egg-shaped or slightly heart-shaped in outline, broadest above the middle; submersed leaves usually wider than the stem; plants long-stemmed........................ ssp. bolanderi (Hegelm.) Calder & Tayl. Shallow ponds, slow-moving streams and shorelines in the lowland and montane zones; ssp. bolanderi- frequent on S Vancouver Island, rare in SE BC, ssp. heterophylla - rare in coastal BC; N to AK, YT, NT, E to NF and S to GA, TX, OK and CA; South America (ssp. bolanderi).